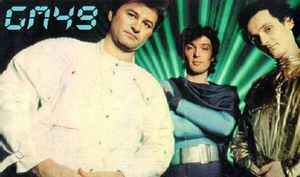 GM 49 is a Hungarian band from the 1980s. The band was formed in 1980 in Budapest, under the direction of the famous Hungarian comedian Miklós Galla. They were the first band in Hungary, who played Ska and Reggae music with ironical lyrics. Their most famous song is “Kötöde” (“Knitting”), “A telken” (“On The Plot”), and “Bélát itt ne keressék” (“Don’t Look Here Béla”). From the middle 80s they played Synth-Pop and released an album called “Digitális Majális”, most of the lyrics are about computers, spaceships, robots and video players. In 1986 GM 49 were disbanded.